Twokinds is an english webcomic that chronicles the tales of a once-corrupt-Grand-Templar and a Fiesty Tiger. The story is set in an immense, yet fictional world - a world that reflects (in an exaggerated manner) issues that plague modern society. Themes of corruption, conflict and subtle racial-warring play an integral role into the plot of Twokinds, which allows the comic to maintain a tension of interest. 779 Files overall (001 --- 779). ~5GB to download. Each image is around 8MB. Unfortunately, as Twokinds was first published in 2003 - at a time when internet bandwidth was expensive and slow - the images that Fischbach distributed are at a low resolution. Any normal attempts to upscale these images will only result in a pixellated smudge, especially with "naive" resizing algorithms (Bilinear, Bicubic). Fortunately, Waifu2x - https://github.com/nagadomi/waifu2x is a solution to upscaling images. It uses the power of your GPU, alongside an implementation of a tailor-made Machine Learning Algorithm, in order to upscale images. Since Twokinds is drawn in a style similar to anime, Waifu2x works really well with the low-quality source images of Twokinds. Please also note that this is a 4-times resizing. 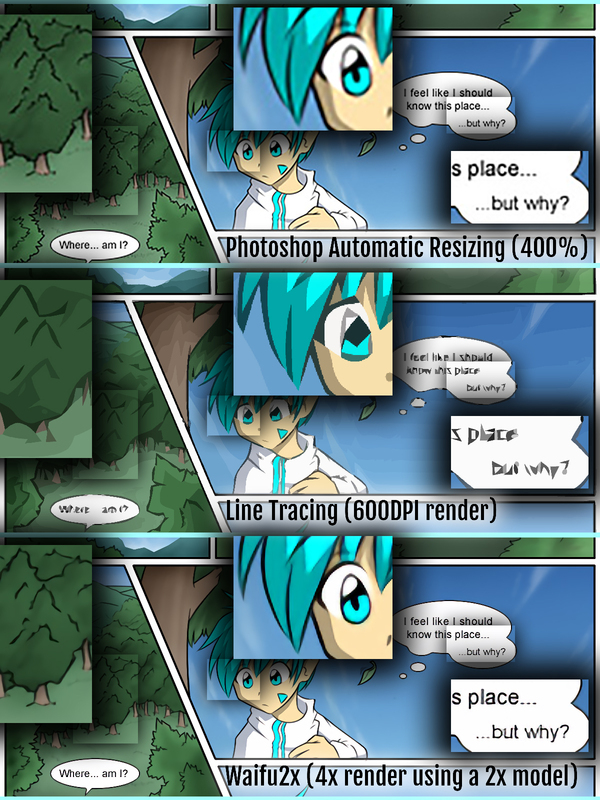 2-times was not detailed enough for my monitor, and so the decision was made to resize it to 4-times. Disclaimer: I do not own the images, but anyone is free to use/download/distribute the upscaled images under the license terms.